Power tools whirred atop the roof of a modest Santa Maria home as a work crew of 10 volunteers mounted a set of solar panels on a sunny November afternoon. Once installed, the new solar grid would reduce the family's electric bill by as much as 80 percent, the workers said. Their efforts, like the panels, came free of charge thanks to the nonprofit Grid Alternatives, an international organization that prides itself on bringing solar energy and training opportunities to low-income families and communities. "These services have been traditionally provided to wealthy individuals, and we're trying to fill that gap," Executive Director Justin Hitchcock told the Sun. "Low-income populations tend to be the last group to receive these types of services and have access. So we're trying to fill that need." Hitchcock heads Grid Alternatives' Central Coast region, which consists of two offices with about 14 employees between its Salinas and Atascadero offices. In all, the company has seven locations in California with other offices scattered across the country and even the globe. Founded in 2004, the nonprofit celebrated a milestone this year, its 10,000th successful installation for a low-income family household. According to Hitchcock, 41 of those installs happened at Santa Maria households. "It's taken a while to expand into [Northern Santa Barbara County], but I really feel like we're starting to have a presence," he said. Grid Alternatives Director of Development and Programs Barby Wunsch told the Sun that much of the work was made possible in Santa Maria due to the city awarding the nonprofit $43,000 in Community Development Block Grant funds. 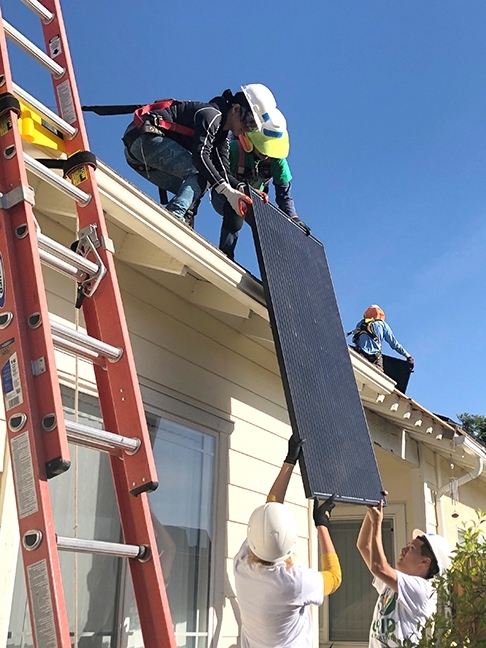 A crew of 10 volunteers helped install a set of free solar panels at no cost to a low-income family in Santa Maria on Nov. 30. The work is made possible by the nonprofit Grid Alternatives. The grants help subsidize and keep the installation projects at reasonably low cost for the nonprofit. Grid Alternatives also works with other organizations, such as the Center for Employment Training in Santa Maria, on its "Solar Futures" project. The program takes 18-year-old high school student volunteers and offers them training opportunities in the solar industry, including in the nonprofit's rooftop installs. "It's a unique program," Wunsch said. 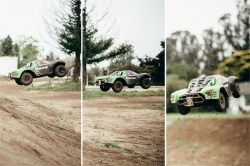 "We're hoping to bring it to Santa Maria, but currently it's only in Lompoc. However the program is still doing work in Santa Maria." Wunsch added that Grid Alternatives tried to focus on cultivating an environment of diversity and inclusiveness when reaching out to its volunteers, just like the low-income families that happen to apply for an install. "We want to make renewable energy accessible to anyone," Hitchcock said. Families interested in seeing if they qualify for a free solar panel installation can call Grid Alternatives at (805) 792-8055 or visit its website, gridsolar.org. • The Foxen Canyon Wine Trail Association will host Christmas on the Trail on Dec. 8 and 9. In all, 13 wineries that span the 30-mile stretch of Foxen Canyon Road are set to participate. Christmas on the Trail is a wine passport event where participants receive 20, 1 ounce pours of wine they can "spend" at any of the 13 wineries all weekend. All attendees also receive a bar of soap from Foxen Canyon Soap Co. The two-day passport is $45 online and $60 for tickets purchased on either day of the event. • The Freedom Monument Veterans Memorial Ceremony and Fellowship Luncheon will be held on Dec. 7 at 10 a.m. at 600 S. McClelland St., Santa Maria. The event will honor all veterans as well as give special recognition to the men and women who serve at Vandenberg Air Force Base. • Parents with kids in need of a special visit from Ol' Saint Nick are in luck thanks to the Lompoc Recreation Division. The city is now taking requests for Santa Claus visits running from Dec. 14 to 17. The hours are 6:30 to 8 p.m. The cost per booking is $30 for Lompoc residents and $36 for non-residents. Visits are limited to a maximum of 20 minutes and will start every half hour. Any location with more than four children requires booking additional time slots. Santa visit applications are available online at cityoflompoc.com/services/recreation or by visiting the Recreation Division's administrative office at the Anderson Recreation Center, 125 W. Walnut Ave.
Staff Writer Spencer Cole wrote this week's Biz Spotlight. Information should be sent to the Sun via fax, mail, or email at spotlight@santamariasun.com.